Minnesota State College Southeast's Continuing Education Department offers an 80-hour Nursing Assistant Training course. 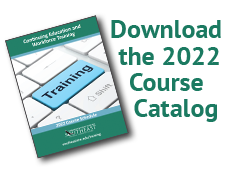 Learn the skills, attitudes, and knowledge essential in giving direct and supportive care in long-term care facilities in a lab setting and in a real-world clinical environment. We also offer Nursing Assistant Testing (and Re-testing) for those who seek to be placed on the national registry. Learn more and register at the links below. Coming Up - Save the Dates! See our Course Registration page for a complete selection of current offerings.